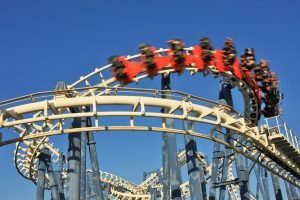 The instability, disruption and resulting anxiety in the legal profession at times feels like a roller coaster: ups and downs, twists and turns, peaks and valleys, fast and slow, feelings of risk, exposure and vulnerability and a lack of control over our destiny. We are more or less along for the ride, which admittedly is balanced by feelings of excitement and accomplishment, and currently buoyed by the economic recovery. The current climate in which firms are experiencing a return to higher productivity and profitability masks underlying systemic issues in firms and delays the urgency for firms to change the way they do business. If there ever was a need for change in law firm business models and leadership, it is now. Firms should not be lulled into complacency because of an uptick in productivity that has been declining or flat for many years. But change is difficult. Law firms and their partners are not alone in resisting change, although one could say they are among the worst at acknowledging the need for it. Renowned management expert John Kotter conducted research in 1995 that showed that change management programs were successful only 30% of the time. Thirteen years later, McKinsey’s survey of business executives found that even after numerous change management strategies had been introduced to companies, only 30% were successful. 0% of clients feel law firms are serious about changing their service delivery model while 9.4% believe law firms are only moderately serious about changing. Clients believe 90.6% of firms are NOT serious about changing! While disconcerting, these statistics and findings should not be surprising. When we look back at recent law firm failures in the last decade or so, the implosions and dissolutions occurred only after peak levels of crisis had been reached as a result of financial mismanagement and lack of financial discipline, the resultant loss of profitability and major defections of rainmakers with top clients/revenues, a lack of glue and vision in the partnership and/or a lack of discipline and accountability around partner greed and other destructive behaviors. Additional insight on why change hasn’t happened is described in a recent American Lawyer article called Outwit, Outplay, Outlast: A Post-Recession Look at Survivors. This article posits that managing partners have had an extremely difficult time making change happen because partners are focused on survivorship. It provides a visual analysis of firms pre- and post-2009 recession. It suggests that most equity partners hear the warnings from their managing partners but business seems relatively unchanged for them and hence no reason to change the status quo. Law firms also are still largely siloed organizations, geographically, by practice disciplines and culturally. This silo mentality often causes power struggles, a lack of cooperation, a loss of productivity and a lack of knowledge. This substantially restricts firms’ ability to work together toward new service and operational models. These traits add to the difficulty of getting lawyers to accept and adopt the changes that are needed. Create Urgency. Firms should not wait for the next crisis: an economic downturn, a major client firing the firm, an important rainmaker or group defecting to a competitor. The impact of those types of crises can trigger the start of an implosion. Instead, firm leaders need to initiate dialogue around difficult issues like many of those highlighted in the Altman Weil report and others, for example, underproductive and underperforming partners and the impact on morale, profitability and talent retention, practice specialties that are in decline and of lower value, partner profits relative to peer firms. Leaders need to create a sense of urgency by identifying potential crises and as Kotter notes, by outlining the need for change through a “bold, aspirational opportunity statement that communicates the importance of acting immediately.” You need to create a compelling “why” for change. Build a Guiding Coalition. Leaders cannot effectuate change alone. They need to have the involvement and backing of a representative group of well-respected partners and other key employees of the firm to work as a team to guide, coordinate and communicate its change management efforts and activities. Members of this group must share a sense of urgency around the change and should reflect the diversity found in firms as well as generational mix and not be comprised only of the current senior leadership. Create the Vision and Strategy. Few firms have developed or follow a well-designed strategy based on a strong and unifying vision. Lawyers are extremely risk-averse and when they are comfortable, highly paid and busy, they are not likely to want to change the status quo. Implementing change will require a bold vision for an even better future that can be easily articulated in a way that stakeholders can see that useful change is possible and that connects the specific initiatives the change team proposes to future outcomes in the vision. Communicate the Vision. At the root of so many problems and impediments to growth and change is the one thing that leaders and others can actually control, and that is communication. Effective communication is always required if others are to understand and buy-in to the change vision and strategy. Ideally, every aspect of firm operations and management becomes guided by the vision. This includes hiring, performance reviews, firing, advancement, compensation. Incorporating the vision into day-to-day activities, problems and implementation will bring the vision to life in a way that people can understand it. Verbal and written communication and validation of the vision must be constant and consistent at every level. It also must be reflected in the behaviors of those leading the change to reinforce the visions by walking the talk. Enable Action and Empower Others: Law firms have a lot of barriers that impede change and innovation. The dominant focus on billable hours and short-term profits, as well as all of the structural and political bureaucracies often make it difficult and discouraging to try to implement changes. Sometimes the impediments are partners or others who adamantly oppose change. Firms will need to remove barriers such as inefficient processes, hierarchies and trouble-makers in order to enable people to work across silos/departments/offices/functional areas in order to generate real impact. Plan for and Generate Short-Term Wins: Lawyers focus on the short-term to a fault. This often means they sacrifice longer term investments and benefits for immediate gratification, usually in the form of year-end, take-home profits. If they cannot see it or feel it immediately, they resist. When implementing change initiatives, however, setting, implementing and achieving short-term goals continuously is the best way to win over skeptics, keep momentum going and maintain a sense of urgency. The key here is that they must be planned and moved into execution to be considered actual wins. Sustain Acceleration: Press harder after the first wins to improve systems, structures and policies that support the vision. Leaders need to use short-term wins to push for even tougher changes, tackling even larger problems. Making sustainable transformations requires time, multiple efforts from multiple sources and the continuous and relentless reinforcement of how each win is facilitating progress towards the vision. Institutionalize Change: Nothing will change in the law firm until the culture adapts its policies and protocols to reinforce the behaviors that lead to success in achieving the vision. Partners and other stakeholders likely will want “proof” that the changes have been effective, and behaviors to comply with the changes will have to be managed with a carrot and stick. Recruiting and advancement in the firm should track the vision and the behaviors required to achieve the vision. Leaders need to communicate the relationship between the new behaviors/protocols and the firm’s success to be sure the new behaviors remain strong enough to replace old habits. It is likely that after any change management process is put in place, the new culture will not be the right “fit” for some partners and employees. These individuals must be managed out as opposed to staying and eroding the fabric of the new vision and culture. In our next blog post Change Management Part 2, we will discuss the need for and the components of strong leadership and collaboration that are essential for change to occur.